The gist of the sign outside the four-club hedonist HQ at ul. Wielopole 15 in the city centre may have raised a few giggles – not to mention an eyebrow or two. It also reveals increasing levels of concern among residents of Krakow’s Old Town, who share their nights, year round, with thousands of tourists. Records show that police have attended disturbances on Wielopole six times since June. They were called to the junction of Św. Tomasza and Św. Krzyża, where many party-goers congregate, 13 times during the same period. Residents have now had enough, and are threatening to sue the city council if it cannot do anything to guarantee them a good night’s sleep. But their campaign faces bureaucratic and practical hurdles. For a start, the city has thrived on tourists and the cash they bring in. This might not be so good for young families looking to buy their first property – Krakow’s Real Estate Market reports since 2004 have shown regular price increases and land and buildings being snapped up by hotel developers and others in the tourist and ex-pat industries. But it has certainly been a boon for many businesses and helped to swell the city’s coffers, and councillors are reluctant to make visitors feel unwelcome. Another problem for Old Town residents is that Polish law makes no provision for the imposition of curfews, and there is no provision for preventing the sale of alcohol as long as the vendor has the correct licence. This latter point came to the fore when residents pushed for a by-law prohibiting stores in the city centre from selling alcohol between 9pm and 6am. Their application went before the city council in July, but was rejected almost immediately. Yet other European cities have successfully implemented such a by-law; in Tallinn, Estonia, stores cannot sell alcohol after 8pm – though pubs and clubs can. What residents do have on their side is convention. It is widely accepted that City Guards can impose fines on drunken party-goers who disturb the peace between 10pm and 6am, and for drinking alcohol on the streets. Last year, officers handed out 5,000 fines for public order offences, and 18,000 for public drinking. It is also illegal for bars and shops to sell alcohol to intoxicated customers – though this can prove hard to enforce. The campaign for ‘Silent Nights’ has also met with some success, thanks to increased patrols by City Guards. Officers now patrol ul. Stolarska every night from Thursday to Sunday, a move that has been welcomed by the business owners. Filip Danielak of the Ambasada Śledzia café, told the newspaper Metro that he has been working with police to help protect the peace of residents living nearby. Extensive patrols, though, are not a solution, according to Marek Anioł, spokesman for Krakow’s City Guard. 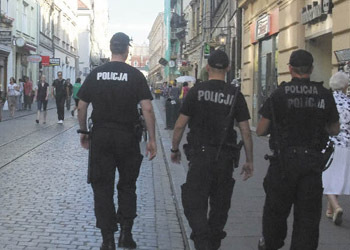 He told the newspaper Gazeta Krakowska that four times as many officers would be needed. Monika Chylaszek, spokeswoman for the Mayor of Krakow, agreed, and said the city was sympathetic to the complaints. This is something that Krakow’s residents have learned – and have shown that they are not willing to put up with.